I’m happy to say that not only Boulevards will be here in Lethis – Path of Progress II, but they will have more importance than ever. First of all, they’re going to be needed to unlock the last levels of the houses. Secondly, you’ll be able to personalize them with specific decorations. Thirdly, they are going to be services buildings specifically for them too. But let’s not put the cart before the horses, first of all, what are boulevards exactly? Boulevards are special roads that instead of being 1*1 elements are lined with decorations on each side, which we’re going to simply call sides. Boulevards are, simply put, 3-tiles large roads. Buildings normally need to be connected to a road to even function, but with Boulevards, a building only need to access a side. Walkers cannot travel on sides, they only use the central path. Their area of effect gets a one tile bonus while they’re on it. Building boulevards will require pavements in addition of money, which a stonemason will build if it can receive stone from a quarry. This means they are way more expensive than normal roads so plan accordingly. Houses that have access to a boulevard can evolve pass the tenth level. We’ll talk about housing in another post in the near future, and i’ll expand on that. But the idea is that Boulevards are an endgame element. Once you built your boulevards, it’s now time to decorate the sides. 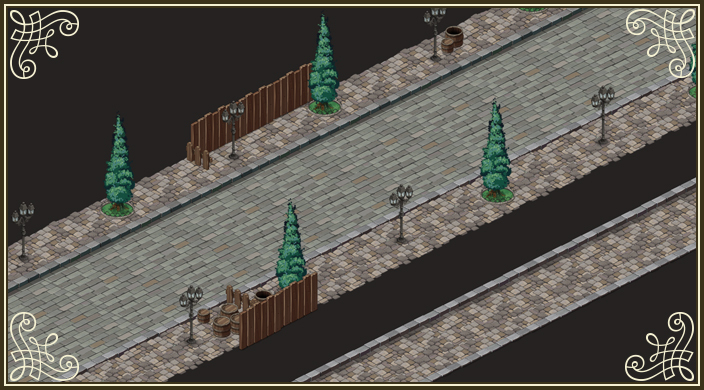 The decorations for the boulevards can only be placed there. They are more powerful than classic decorations, mostly because they generate more appeal (and you’ll need a lot of appeal to evolve the last levels of the houses). They are also, you guessed it, more expansive. Some of these decorations work a bit differently, they will need to be visited by walkers from specific service buildings. The payoff is a huge bonus for the houses around them. The lamplighters office will generate lamplighters that are going to maintain the streetlights. Streetlights left unattended won’t give you any bonus, but once a lamplighter patrols the area, not only you’ll get to see them shine light on your people, but you also get a major bonus that is not only appeal. We’ll talk more about it when you’ll be familiar with the Housing system of Lethis – Path of Progress II. It’s only one of the specific services we want for the Boulevards, we’d like to add a second one eventually. We’re not decided on it yet. Boulevards are meant to be used to build your town center. The requirement on ressources prevent you to start your city with them, but the bonus they provide make them the perfect tool to imagine your most efficient and evolved neighborhoods. It’s going to be possible to play Lethis – Path of Progress II without even using them, but it’s going to be much harder to only use them from the start, which we think we allow for more diversity in the design of the cities. Will this game have any military options like Cyber-Victorian forts, with formation armies? We can’t play the war in Lethis – PoP II but it will be present. The player will have to suffer the war effects on his city. Uau! Awesome idea to add gameplay mechanics tied to the use of boulevards. 1 – Will there be a smaller type of boulevard ( only 2-tiles wide road with just one side )? 2 – How will boulevards “behave” on corners? I ask this because previous games with boulevards ( Zeus and Emperor ) did not allow us to build 3×3 corners, they only allowed 3-way and 4-way junctions. 1 – There will be no small boulevards. We only keep the idea of big avenues. 2- Boulevards will have turns. We are looking for an elegant solution for 3*3 corners. The “small boulevards” were only usefull in the games I’ve mentioned because the “big boulevards” could not make turns due to the way they were built (on top of existing roads). Since, in Lethis 2, the boulevards will have turns there’s no need for “small boulevards”. I’m assuming that, on Lethis 2, boulevards will be placed separately and not required to be placed on top of existing roads. We don’t know yet. It might be a completely different building, or it maybe something to add on top of roads, we’re going to need to try this out.